We are looking for a sailing exit window to make the run from Miami to the Exumas. This run is only about 200 miles but it is nearly due east. The trade winds normally are blowing from the east and that makes it impossible to sail east. The winds will shift to the south when a storm up north in PA, VA, NJ, etc develops and then drags a cold front across Florida and out to sea. When this happens, an approaching cold front, these SOUTH winds develop and that lays down the northward flowing gulf stream and makes for even a better crossing. With south winds we can sail all the way east up onto the Bahama Banks and then keep sailing all night long into the tongue of the ocean and onto one of the three customs and immigration check in points. These are: Chub Cay, Andros Island, or Nassau. We like Andros or Chub. Waves in the gulf stream can be 5-10 feet when the north wind is blowing against the north flowing waters. The other situation is that an approaching cold front also means approaching strong North West and North and North East winds as the front moves through the area. That too is a bad situation because many of the hiding places are not good in North winds, most are protected from East winds. This weather timing game is a real challenge. You can have a calm peaceful passage if played right or you can beat yourself up and break your boat by getting the decision wrong or by having the winds and cold fronts advance faster than expected. We have our boat loaded, fully stocked up as planned for a March 1 exit. All systems have been checked, and we are waiting. Waiting for a good weather window. Waiting means enjoying the Biscayne Bay beaches, anchorages, South Beach, Key Biscayne, etc. We visit with boat buddies, share plans and routes, have cocktail parties, and walk the Coconut Grove town. It is not a rough job to wait for a good weather window especially when here in the Dinner Key area. There is plenty to do and plenty to entertain yourself with, so we have no problem waiting. Remember, our goals this year are two: #1, Biscayne Bay area for at least a month; #2. Block Island for the summer, everything else is a bonus. So let’s wait for a good weather window…. Here are images we are studying and tools we are using. We are living a dream…. People ask, “What do you do all day?” and many times we are not really sure. We are simply living each day with friends, sunshine, warm weather, boating, and exploring the area. This month we have spent on Biscayne Bay based out of Dinner Key Mooring field and accessing Coconut Grove. Miami, Miami Beach. South Beach, Key Biscayne, Elliot Key and Boca Chita Key. We walk many miles exploring the area, we ride the excellent public transit system north to Miami and we boat over to Miami Beach when we want to walk Lincoln Road and Ocean Drive. We sail, we anchor out, we swim and we walk beaches. We visit with boating friends new and old and we try to keep up with communications via our SSB, email and Facebook. The really crazy aspect is that we seem to be too busy enjoying the above that we wonder….”What are we doing? Why are we so busy? We can’t get anything done!” So, when asked, “What do you do all day?” we LIVE…..ENJOY….and HAVE FUN. Recent fun that we sadly do not have a photo to share was our great visit with a former PVHS colleague of Hayden’s, Gordon and his wife Pat. They kindly met us for a delicious Mexican lunch and many laughs. Thanks again for making time for us! Replacing salon bottom seats foam with new foam…very comfy! 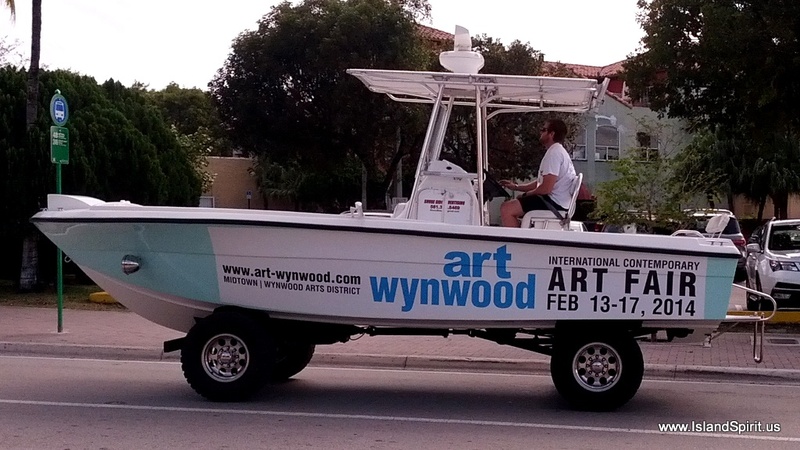 When Boat Shows and Art Shows get together! Again, living this cruising life on a sailboat is a real joy. It is easy, peaceful and adventurous. Soon we will move on, leaving Biscayne Bay behind as we sail to the Bahamas. We plan on March and April in the Bahamas and then back to Maryland in May. Thanks for sailing along…. We have lost two very dear cruising friends whom we love so much. Bobbi and Debbie are friends that we have spent ten New England summers with and shared many destinations, sunsets and passages. As my good friend Carey says, “You never know what the future holds, so you need to get out here and go cruising while you can!” and that is exactly one of the key reasons why we are out here cruising. For 18 brave months, Bobbi battled breast cancer and Debbie fought ALS, passing away only 4 months apart. It was our privilege to celebrate their lives at beautiful memorials, for Bobbi in Rhode Island and for Debbie here in Florida. We miss Debbie and Bobbi immensely as they both are such beautiful friends, inside and out. When we see dolphins, we think of Bobbi, and when we see butterflies, we think of Debbie. We will treasure their loving friendships always. We have taken comfort in this poem given to us when Radeen’s father passed away in 1984. Once again it brought us peace during these sad times. The TEAM at sunset on the Island of Boca Chita, Biscayne Bay, FL, February 2012. IP-440 Charmed, IP-460 Cutter Loose, IP-380 CAVU, IP-35 Island Spirit and SP Cruiser Catspaw. Here is news I posted to our IPYOA Community Site, please see it below the questions: Hayden joined the Whiteaker Yacht Sales Team! #1. Will you stop cruising? NO, we will not stop cruising. We plan to continue sailing the East Coast from New England to Florida and into the Bahamas. Owning two Island Packet Yachts since 1991 gives us a unique perspective into the fleet of boats and the IPY community. We look forward to helping others buy and sell their Island Packet Yachts. #2. How can you work from the boat? No problem! Team Island Spirit earned new online Master’s Degrees from Drexel University in 2008 while living on this boat, 45 graduate credits total. We are fully connected 24/7 in the USA and in the Bahamas with our onboard networks of WiFi, 3G and 4G. Helping owners list, sell and buy their yachts should not be a problem. With the support of Debbie and Ed at the WYS home office in Palemtto, Florida, we will have plenty of support and guidance. #3. Do you need a License? Yes, I have a Florida Yacht Salesperson License. Florida and California are the only states that require a license to be a Yacht Broker, which is actually called a Yacht Salesperson. Whiteaker Yacht Sales is based in Florida, so every WYS broker has a license. I secured mine in early December 2013. It is a real benefit to have long-time Island Packet owners and live aboard sailors working with Whiteaker Yacht Sales. William and Hayden can offer their insights into the various Island Packet models and help people find their dream yachts. If you are an existing owner of any yacht model thinking about selling, we encourage you to place your listing with the Whiteaker Yacht Sales Team. Everyone there will work very hard to sell your yacht in a timely manner. Whiteaker sells more Island Packets than any other broker and has been awarded a new Legacy Island Packet Yacht Dealership. This dealership covers the Gulf Coast, Florida, Georgia, South Carolina and North Carolina. If you are thinking about purchasing a new Island Packet, then please alert us to your plans and we will begin a discussion about new IP models and factory production schedules. Thank you for considering William Mayberry, Hayden Cochran and the entire team at Whiteaker Yacht Sales for buying and selling Island Packet Yachts. We know and love Island Packets and look forward to helping you! 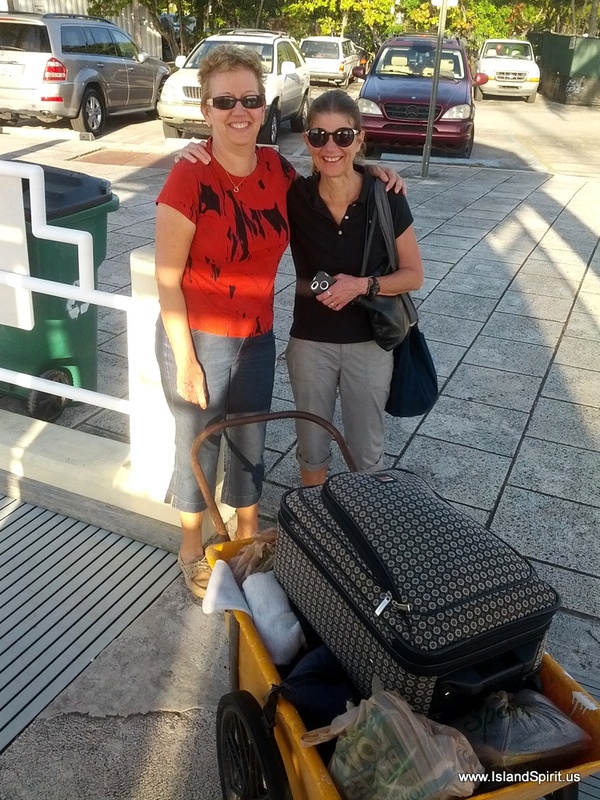 Gail and Radeen at Boca Chita…. Radeen’s college roommate and bridesmaid, Gail, and her husband, Jim, also our college friend, made the trek from snowy PA to Miami for some Island Spirit time. They arrived via a one way flight PHL to MIA direct on American Airlines. They took us up on the offer of a free car, our 2003 Ford Taurus, which they could use for explorations as they return home. This was a win/win. They get a free car and we get the car from Florida back to PA where we will be in late May. Adventurous people these guys are and we really appreciate the car move. The week flew by but not without tons of fun. great meals, plenty of wine and beer and simply enjoying and sharing the Biscayne Bay area. The week progressed with watching some of the World Cup sailing races, exploring Boca Chita, part of Biscayne Bay National Park, then on to South Beach for the Miami Marathon and a live New World Symphony Wall Concert in the park. Next we sailed to a sandy beach off Virginia Key and went swimming with IPs Catspaw and Tamarak. We came back to Dinner Key and Coconut Grove for some town exploring, including a fascinating tour of The Barnacle, the original home of a brilliant early settler, photographer and boat builder. Then we had a dream day of sailing all over Biscayne Bay in 15-20 knots of east winds. We ended the day anchoring off the Nixon Estate with a wonderful meal on anchor with boat buddy Tamarak Bill. On our last day, we drove to Biscayne Bay National Park in Homestead, small but very interesting. The movie on the history of Stiltsville was timely, since we had just seen the seven remaining homes by boat. We did errands, such as an oil change for “Goldie” and stopped at Home Depot and Publix. Gail and Jim took us out for a delightful dinner in Coconut Grove at Calamari, a wonderful Italian restaurant. Radeen and Gail out did themselves cooking dinners and fixing great snacks and drinks. Most meals were cooked on board except for a few meals out. In Coconut Grove, we enjoyed The Green Street Cafe for breakfast and Lulu’s for dinner. In South Beach, we had breakfast at The News. Team Island Spirit loves living and cooking on board and sharing this beautiful life with close friends. Jim and Gail had a great time and they now see what we have been dong for the past three years! Here are the best 50 photos of the week, starting with the bountiful treats Gail and Jim brought us!